It's an exciting time for nature lovers. The world's largest flower, titan arum – known as the corpse flower thanks to its notoriously horrible odor – is about to bloom for the first time ever in the Chicago area. Over at Montrose Beach, a rare carnivorous plant has taken root. Not to worry: It's still safe to go to the beach. The great bladderwort (Utricularia macrorhiza) isn't a man-eating plant, it feeds on insects and larvae, much like the swarms of dragonflies we've been seeing on the lakefront this summer. Here to help us dig deeper into Mother Nature's mysteries are Tim Pollak, outdoor floriculturist at the Chicago Botanic Garden; Greg Spyreas, a botanist with the Illinois Natural History Survey, an ecological research institute based in Champaign; and biologist Doug Taron, Vice President of Research and Conservation at the Peggy Notebaert Nature Museum. Titan arum, "Spike," on August 3. (Photo by Robin Carlson) Commonly known as the corpse flower for its signature scent – reminiscent of rotting meat – a titan arum named Spike has been on public display at the Chicago Botanic Garden since Aug. 6. 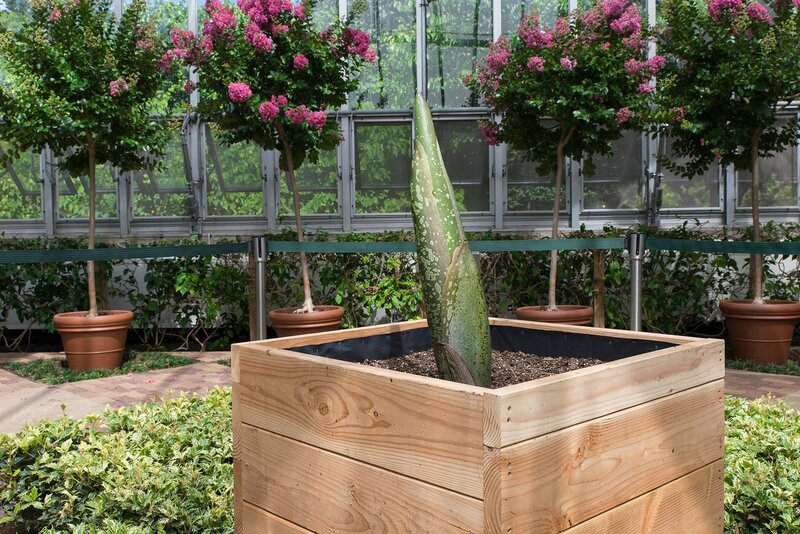 Spike is expected to bloom at any moment, and the garden plans to celebrate its arrival by staying open until 2:00 am so as many visitors as possible can see – and smell – the impressive plant. Expect to see a spike that will be 6-8 feet tall, skirted by a huge, maroon flower at its base. The frilly bloom will close about 24 hours later, so plan accordingly if this is on your bucket list. It could be years before a titan arum blooms again at the botanic garden. In fact, Spike's big day has been 12 years in the making. We have been cultivating nine of these mysterious plants behind the scenes in the production greenhouses, watching them grow foliage each year, and guessing what a flower might look like as it emerges. Today we are so excited to be moving Spike to the Semitropical Greenhouse in the Regenstein Center. (We have named our titan arum Spike because when you grow a plant for 12 years, you start to think of it as a child.) Spike is growing several inches every day. We are so proud of Spike and are also thrilled he is the first titan arum to bloom in the Chicago area. The great bladderwort's bladder-like pouches trap prey. On Monday, Chicago Tonight reported that a carnivorous plant had been discovered at Montrose Beach Dunes. The tiny plant (Utricularia macrorhiza) topped with bright yellow flowers preys on water fleas, zoo plankton, and other small aquatic insects. (So, no need to cover your toes the next time you're out for a stroll.) The finding is scientifically important because, although the plant has been seen in the Chicago area, it hadn't been identified at the Montrose Beach Dunes until Aug. 1. Interestingly, the plant doesn't operate in the classic Venus flytrap style of Little Shop of Horrors. Instead, the action takes place under water, where tiny hairs covering bladder-like pouches serve as mechanisms for catching prey. An aquatic insect swims by, triggering the hairs, which in turn release water from the pouches. When the water rushes back into the pouches, a vacuum is created, catching the insect. There are 14 different species of carnivorous plants in the Chicago area alone, and they all tend to be very specialized and very rare. Most [people] never notice the plants unless they are looking for them. See more photos of titan arum and the great bladderwort.